Huangshan ( 黄山 The Yellow Mountain) is located in Huangshan City, Anhui province, next to Shanghai and Hangzhou. 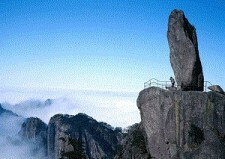 Huangshan is dubbed as the “NO.1 Mountain Under the Heaven”. There is a saying goes ” You don’t need to see other mountains after viewing the Five Mountains, and you don’t need to see the the Five Mountains after seeing Huangshan.” Huangshan, a UNESCO world heritage site, is an amazing natural wonder that you must visit when going to China. 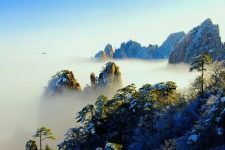 This Huangshan 2 day tour will take you to visit the highlights of Huangshan mountain and you will stay overnight on the mountain top to enjoy sunset and sunrise. Arrive Huangshan by train or plane. Our tour guide and driver will pick you up and then drive to Huangshan Scenic Area (1 hour ride, 60 km). Then you will take the Yungu cable car (云谷缆车) to up to the top of Huangshan mountain. Visit Beginning-to-Believe Peak (始信峰), Brush Pen Peak (笔架峰), the Lion Peak (狮子峰) and enjoy magnificent sunset (观黄山日落). Stay overnight at the Beihai Hotel. Get up early in the morning to enjoy a breath-taking sunrise over Huangshan（观黄山日出）, this will be a memorable experience and highly recommended. Then go back to your hotel for breakfast. After that enjoy the amazing views at Cloud-dispelling Pavilion（排云亭）, see the Flying-over Rock (飞来石), visit Brightness Summit（光明顶）. After that take the cable car down the mountain (云谷缆车下山). Head to Huangshan city and explore some interesting things in Tunxi Old Street (屯溪老街). You will also have chance to visit a Ink-stick Workshop (徽墨工坊) to learn how the famous Hui Ink is made. Then transfer to airport or railway station for your next destination. 4 star Beihai Hotel on mountain top of Huangshan. 1. If you want to stay in a single room. the single supplement is USD95. 2. Additional USD25/pax for weekend (Friday and Saturday Night) stay on the top of the Yellow Mountain. 1. Private car with experienced driver in Huangshan. 2. 4 star hotel based on twin-share basis with breakfast. 3. Private English-speaking tour guide. 4. Entrance fees to tourist spots mentioned above. 5. Round way Huangshan cable car. 6. Meals mentioned above (B=Breakfast, L=Lunch, D=Dinner). To travel from Shanghai to Huangshan is easy, you can take bullet train, overnight train or flight. If you have 2 or 3 days in Shanghai, it is a good idea to take a Huangshan Mountain tour. Note: The above tour package rate is based on second class seats, if you need first class seats, please contact our trip advisors. Note: If you need flight tickets between Shanghai and Huangshan, please consult with our trip advisor. Hangzhou is 220 km from Huangzhou, you can take a Yellow Mountain tour easily by transport of 3.5 hours bus or 3 hours bullet train. Hangzhou West Bus Station ( 杭州汽车西站) – Huangshan Tunxi (黄山屯溪快) . The bus is available from 06:50, 7:50, 8:40, 9:40. About 2.9 hours ride. Ticket price RMB88. You can buy the ticket on your own. For the back from Huangshan. Our guide can help you buy ticket back from Huangshan at bus station. We can buy train tickets from our side. There are many trains running between Beijing and Huangshan, it takes about 6.5 hours for a single way.